Sorry about not posting yesterday, but I was working to finish this and I couldn't stop! I'm happy to report today that I am done with the valance, and it is hanging, and I am very pleased. For once something that I did worked out! It pretty much looks just like I had envisioned. Originally I thought I would do the design across the whole length, but I think this is nicer, actually. Thanks for all the finishing advice. I wound up lining it with a fairly opaque drapery lining, using the selvage on the lining as the hem, and making it just a smidge shorter than the actual valance, after hemming. Then I added that strip of twill tape about a 1/2" below where the top seam was going to be (I was going to use ribbon, but then saw the twill tape and that worked just as well), stitching it onto the lining first, and leaving a little gap in the stitching every six inches so that I could clip a ring into each little gap. The curtain guy at Mill End Store told me to do this and I think it was a great idea — this way, you dont have to clip those things to your nice valance. Then I just hemmed the sides of the valance, and stitched both pieces, right sides together, at the top. The finished valance has enough heft so as not to get all floppy and awful, so I skipped adding the stabilizer to the top edge. It's hanging just fine, and doesn't have a lot of fullness. The opaqueness of the liner means you don't see the threads carried across the back at all — the individual crosses on the design really pop. I was afraid that if I lined the curtain with something before embroidering it would be impossible to get that lining perfectly smooth, as I moved the hoop along the design? Maybe I'm wrong about that. And thanks to those who recommended not using iron-on interfacing after all — the idea that it doesn't age or wear as well as the rest of the fabrics was something that hadn't occurred to me. So the lining and the actual valance here are not connected anywhere but at that top seam, and I am pleased. If I had it to do over, I would've spaced my clips so that I didn't have one right in the middle, but I forgot there was a little hook there to hold up the center of the rod. 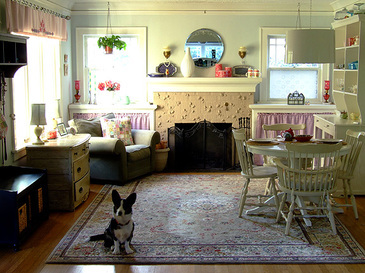 So, I'm happy with this pretty little dining room (the dark green room is the living room, and it has the same windows, and the bright curtains, and is connected to this one by a big arch). Looking at this photo, I think I should rotate that table 45 degrees, so the chairs aren't parallel to the wall, you know? I'm embroidering those little curtains on the bookcases now (the bookcases are filled with a whole bunch of unattractive junk, so I always have them covered, because one thing our house does not have is storage). I'll show you that coordinating design soon. 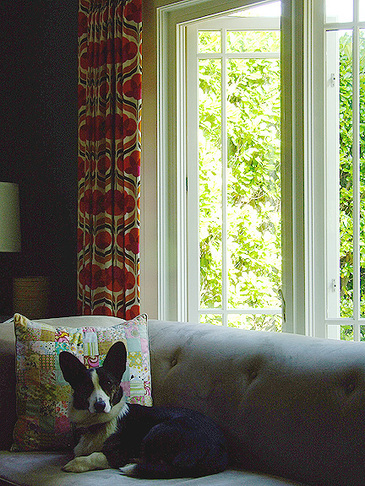 Right now this sweet little black-and-white needs a walk! 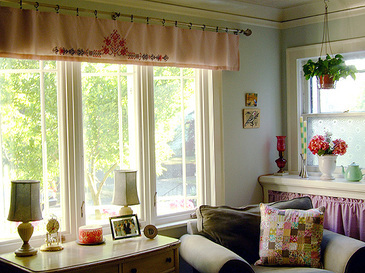 This valance is 1/8" gingham in a sort of mauve-y color that I absolutely love, especially with red. Go figure. 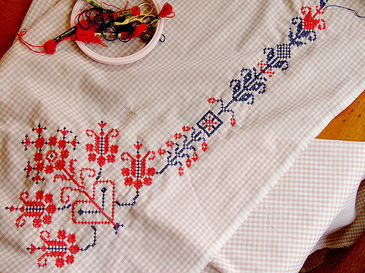 The motifs are from Charted Folk Designs for Cross-Stitch Embroidery: 278 Charts of Ancient Folk Embroideries from the Countries Along the Danube. This is a very cool book, chock full of snippets of amazing borders and designs. I went through the book about ten times before I was able to decide which ones to use. I recognize several of the charts here incorporated into the lovely full-size patterns available at Folkology (I've had a couple of their table-linen patterns for a long while, but I haven't made them up yet). What I love about them is: one or two colors. That's it. Such amazing patterns using only one or two colors. I love that. The gingham is poly/cotton from the Mill End Store. 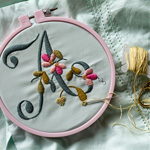 I love the way it looks, but t's not my favorite thing to embroider on, by any means — if you tighten the hoop too much, it will definitely snag and distort the fabric. It has a lot of show-through, so this valance will need to be lined. 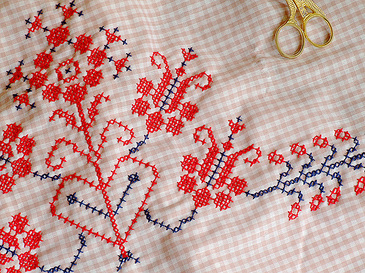 I would've preferred to to use an interfacing behind it, because (especially when it is hanging against a lit windowpane) I can see the floss being carried on the back, behind the crosses; but I REALLY hate iron-on interfacing, big pieces of it at least, and I knew it would get all bunchy and awful if I hooped it after I ironed it on. Etc., etc. So I'm thinking I will either use a separate layer of curtain lining behind the valance, or maybe iron-on some interfacing after it's all stitched (if I'm in the mood to wrestle it). 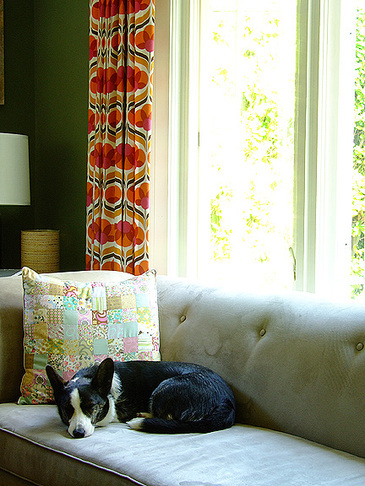 Then add a border of sew-in curtain stabilizer to the top edge (it's like a three-inch strip of very heavy interfacing that helps the top of the valance or curtain hold its shape, so it doesn't become a big floppy mess). And then I'll add black clip-on rings to the top, which will pick up lots of little black accents in the room. I may add a strip of grosgrain ribbon to the back side of the valance — you clip the rings onto this ribbon from behind, so that you don't see the actual clips when the thing is hanging. But I haven't decided yet. I'm tired just writing all this, actually. 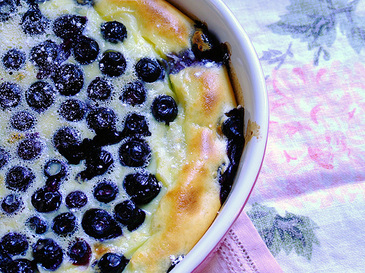 Maybe the To-Do List is Under this Pancake? 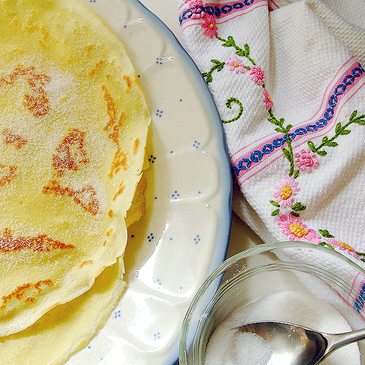 My favorite: a Swedish pancake with a sprinkle of sugar, rolled up and eaten with my hands on Sunday morning. With good, hot coffee. In front of open windows. While looking out at my hostas and hydrangeas. Yeah. Sigh. I'm so behind. I don't even know where my to-do list has got to. I need to find it. Oh well. Back to work! I'm going to try to answer all my emails today, and get some assignments done, and mail some stuff off, and hopefully, hopefully get caught up. I don't like the feeling of being behind. I frequently feel that way, too. 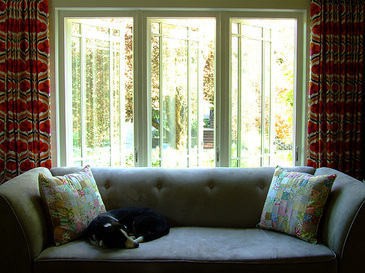 Thanks again so much for all the window love, and again for the Tanglewood enthusiasm over the weekend — I am still so thrilled about that, and will put a Flickr group together for those (I mean, when I find the to-do list, I'll put that on it). But I am so anxious to see the finished bags. One thing I know I need to do: I keep meaning to point you toward three interviews I was so flattered to be asked to give recently. Sweet Becky asked me some excellent questions about business and blogging at her site about inspiration and creative entrepreneurs, A Hidden Pearl. The lovely Lisa Lam of Craft Boom has an incredibly lively and informative blog for crafty-business types and anyone interested in online marketing, and also asked questions from a perspective I don't think I'd really thought about before. Great questions. 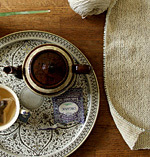 The ever-generous Bee Clinch, one of my favorite crochet designers, recently started a new blog called Chain Creative. She asked me about crocheting and blogging recently, and I loved doing this one. I'm sorry it has taken me so long to mention these, but I hope you enjoy them! I love doing interviews because it gives me a chance to really think about the specific topics and figure out what I really feel about them, but it takes me forever to finish them. I just don't know where the time has gone this summer, or this weekend. 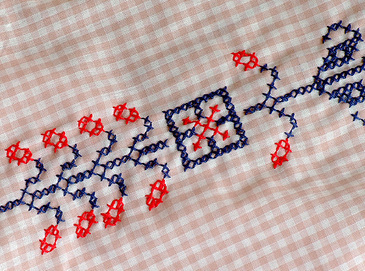 Possibly into the approximately seventeen hours I have spent watching ABCFamily and cross-stitching a nine-foot-long gingham valance for my new dining-room windows. Possibly. I'm not sure. But possibly. I write tonight while seated in front of three lovely, open windows. Through them a beautiful breeze blows, and I hear the sounds of leaves rustling, a plane going over, children playing. From here on my sofa, now I can smell my neighbor's barbecue, the wet dirt from the planters on the porch, and the new paint on the new windows. 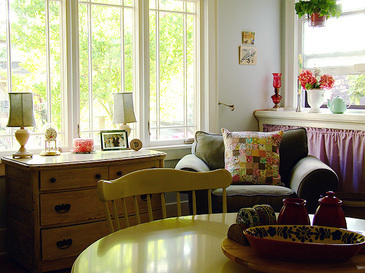 For the first time in eight years, I have open windows in my living room and dining room. I'm so very happy today! Where once was a big, plate glass, unopenable picture window, we now have three side-by-side vertical casements that open out. They don't need storms; they also have beautiful removable wooden screens on the inside (not shown, being painted). (These photos are a little dark because I am trying to get the detail in the windows, so I take the light-meter reading there, and not in the room as I normally would. Not sure how to get both lit properly. . . .) The above photo shows the windows in their "closed" position because they are kind of tricky to photograph without getting a lot of reflections and lines and stuff. But really, I've had all six of them open (there are three more in the living room) all day, even though it was about fifty degrees this morning. I love them so much. Here they are open. 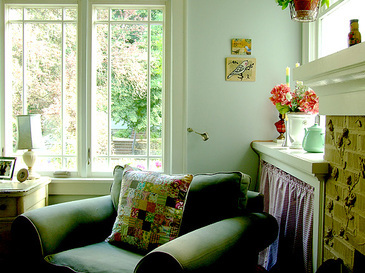 Don't you just want to sit down and read a book there, and listen to the birds sing? I'm late posting today because that's basically all I've been doing. Oh, puppers, you are such a sweet darling little miss. She likes them. So do I. I told the installers yesterday that it was one of the best days of my life. Then they felt sorry for me, I think. But it was true. I have light and air now. It's such a privilege. 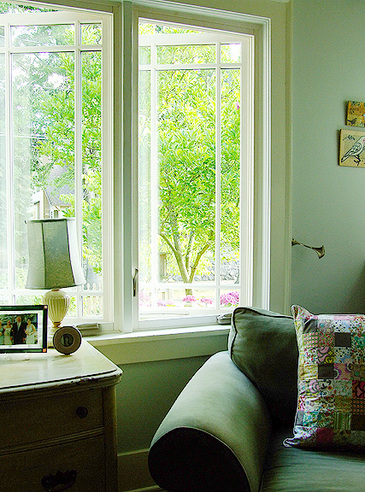 Living without air in this room where I spend so much of my life has given me a whole new appreciation for the open window. It really is a gift. So, have you noticed the signs? Extreme irritability? A sudden obsession with air flow, or the lack thereof? Cravings for M&Ms and bad TV? (Wait, I always have that.) An uncanny talent for boring anyone in the room with an explanation of the differences between (along with detailed, uncomfortable-making price comparisons of) vinyl, fiberglass, and wood? It's true. I'm window replacing. The window in the background of the above photo is not one of the ones we're replacing — I'll have to take photos of those tomorrow, before they go. 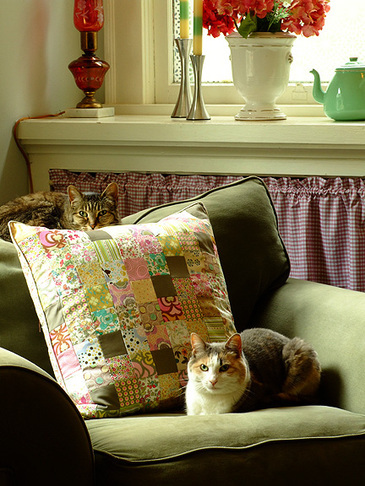 But I did make new pillows for the living-room sofa and dining-room chair (this is the dining-room chair) in anticipation of new beautiful windows, and you know how my cats are always the first to welcome any new textile creation onto the property. No exception here. What's unique about this photo is that I just came into the room and there they were, hanging out by a pillow together, happy as pie. Even though these two cats actually pretty much hate each other, try to punch each other in the face about seven times a day, and only sat here looking angelic (ish — I think the Bee looks fairly [and typically] sinister, though Violet looks predictably adorable) together for approximately four and a half minutes. I get them to look at me just as the shutter snaps by yelling, "Hey, cats! Hi, cats!" and waving my hands up in the air. You can see how thrilled they are by my attention. "That lady would like me to do something. So I'll take a nap." 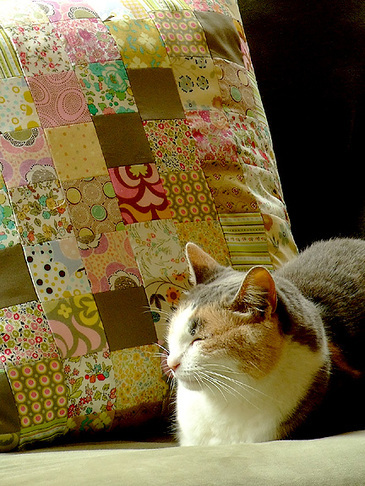 Each 20" patchwork pillow takes one hundred 2 1/2"squares. I made simple envelope backs out of various calicos, and put some nice oyster-colored piping around the edge. I made three pillows, all similar but not exactly the same, each from two sets of Precious Bundles (plus four extra patches; I'll throw those in for you if you order two sets). I will tell you that it pays to purchase the best pillow forms you can afford — get heavy, downy forms. They make the pillow look so much better it's ridiculous. I used Soft Touch forms from Fairfield. I don't like real down, but these imitations feel really good and substantial and squishy. You know how picky my pets are about their pillows and all. Such a fun weekend. It actually felt long. We went out, had people over, celebrated our anniversary, went to the farm, went to the park, cooked for friends, ate out, stayed in and ordered pizza, played games until it got too dark to see, sat by our new outdoor firepit, gardened, and just generally had a great time. Even Clover Meadow, who is such a good girl (and totally off-leash trained in the front yard — yay Clover! ), really, really enjoys it when friends come over to play. Here she is with Andy and Oliver, taking a break from Zimm-Zamming. Don't you love it when they rest their chins like that? Our girl does love an overstuffed pillow. She gets that from me, I think. Thank you for all the Tanglewood orders yesterday!!! Wow — I'm so thrilled that that went over well, you have no idea. I was really hoping it would, and I seriously can't wait to see what everyone makes. More fabric for the Precious Bundles arrived yesterday, which was perfect timing because I had almost perfectly sold out of the bundles I'd already put together (which almost never happens — you almost never get the number exactly right). So those will be available indefinitely, and I'll show you something else I did with those little patches next week — obviously, you don't have to use them for the bag, if you have something else in mind. I have now sewn together approximately six-hundred-and fifty 2-inch fabric patches in the past two months. I'm not even kidding. I'm not sure what to think about that, but I was very happy almost all the way through, I would say until about the last eight or nine, where I just let out one long soprano-like scream the whole time, so it's been a good run overall. And definitely let me know if you have any troubles with the patches or the pattern, and I'll do my best to correct that, pronto. Thank you again! 2. Many people wrote in after listening to The Splendid Table on NPR on Sunday to warn about the dangers of sun tea, discussed on the radio just that afternoon. I'd never heard this before, but apparently brewing tea in a jar in the sun only allows the temperature of the water to reach 130 degrees F — perfect for brewing bacteria. So it sounds like it's best to keep it overnight in the fridge. More info about that is here. I've made about five different kinds of tea this week, using some of the many recipes suggested — and thank you again for so generously sharing those — and I'm going to ask a self-confessed tea guru to tell us what she knows (Miss Howard, please begin work on that book report, won't you?) next week. 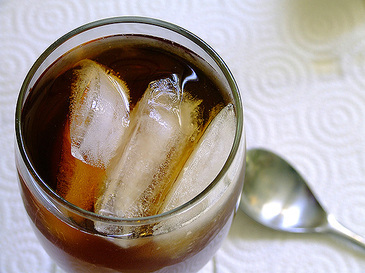 My next goal is to figure out how to make a good glass of Thai iced tea, which I have never successsfully done. Mine's always weak and tan, instead of yummy and orange like it is in the restaurant. I can't get this right. Yet. 3. What else. I forget. Oh yeah, corgi picnic! 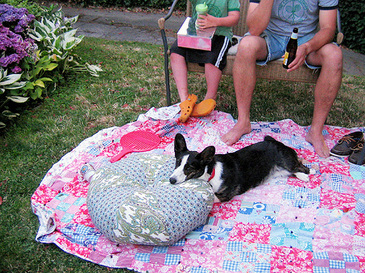 Well, I'm sorry to say there really aren't anymore photos of the corgi picnic. With a dozen corgis hanging around and the weather scorching and me in a skirt (forgot those corgis are short, and to take their photos you really have to be in the dirt, so that didn't work). I just put the camera down and watched them . . . not play. It was so bizarre. Everyone was commenting on how nonchalant their dogs were about the whole thing. Apparently, when at the corgi family reunion, the corgis take on a very so-what, who-cares, when-can-we-go-home? kind of attitude toward each other. I could not believe it. Perhaps it blew their minds or something, being confronted with so many others when they thought they were The Only One in the World (at least ours thinks that). She was like, "I really don't know what we're doing here. Let's go over there and sit by that tree by ourselves, like we usually do." Naturally, Clover Meadow was the prettiest girl there, and we have encouraged that kind of thinking, so what can you expect. Unfortunately, it wasn't a fenced-in area so everyone was on a leash, for the most part, so they didn't really get to run and play. But just seeing them together makes me laugh. They look so serious, and then we just bust out laughing right in their faces. Ah, corgis. I love them. 4. Who's psyched for 90210 redux? I am. Tanglewood Sale: 9 a.m. PST Today! They're finally ready: The Tanglewood Bags all sold now — thank you! 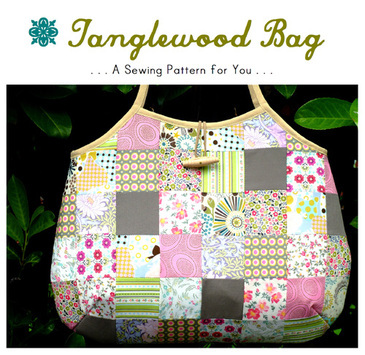 ), the Tanglewood Bag Sewing Pattern, and the Precious Bundle: 48 Patches for You to Make a Tanglewood Bag will be in my web shop at 9 a.m. PST this morning! Yippy! There are only a few bags — very few. If any of them do happen to sell at the same time, I will have to give them only to the first orders that come in; if you aren't first I will send you an email as fast as I can letting you know, with my apologies. Please refresh the page frequently to see what has sold before placing your order. I know this is a total pain but it is my best available system for reasons too boring and numerous to mention right now, so I really do apologize for the annoyingness of this. And I sincerely thank you for your patience. 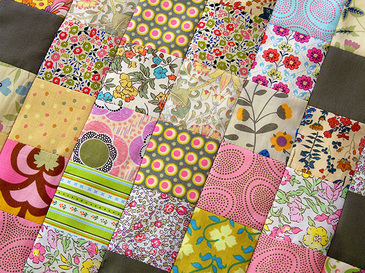 Moving on to the pattern! I'm psyched about the pattern! It's available as a downloadable PDF only, so you'll need Adobe Reader to see it and print it. It comes with a full-size bag template, so all you need to do is print, cut, and tape the pattern pieces together — no need to enlarge. The instructions are fully illustrated, like a tutorial, so each step has a photograph or diagram to walk you through; however, as I mentioned before, I wouldn't really recommend this pattern for a beginning sewer. There's a lot going on here, and while none of the tasks involved are particularly difficult, each does take a fair amount of precision-sewing and patience. The results are well worth the effort — I don't think I've ever made anything I like as much as this bag, and carrying it has been great. But it's not a quick-sew; it's a whole day. And since this is a brand-new pattern, please let me know if there's anything that just looks wrong — I'll make every effort to correct that, and appreciate the head's up. Lastly, instead of putting together entire kits of supplies, I decided that the most important part of this bag is the carefully edited collection of fabric patches that I've assembled for the front. So I'm offering a limited edition of Precious Bundles: 48 Patches for You to Make a Tanglewood Bag. I did all the work for you here, baby! 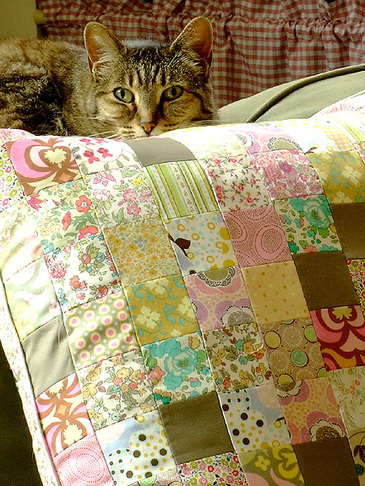 Each collection includes the finest-quality cotton calicos, as well as eighteen patches of six different Liberty of London Tana Lawn fabric — I started with over a dozen different prints of Tana Lawn from several sources, and I think they are just so gorgeous together, however you shake and serve them. Everything's pre-cut. Each bundle is unique, though similar to and incorporating many prints from the other bags you'll see pictured in the web shop (though all bundles will have the dark olive, as above, as their solid color). I don't know how many of these bundles people will want to order, but I plan to keep renewing the supply if there is enough demand. If they go quickly today, there will definitely be more coming this week. Okay, I think that's it! See you at 9! Greetings from the Corgi Picnic! I was totally giggling at the comments yesterday! Here I am, all filtered this, organic that, nectar the other thing. Trying to impress you with my epicurean and pedantic approach to the brew (and my big vocabulary — is it working? Didn't think so). But y'all are just like Lipton! Sugar! [from the southern belles] and What's iced tea? [from the Brits] and What's this pitcher of weird brownish stuff doing where my chocolate milk's supposed to go? [from Andy Paulson, looking, quizzically, into the fridge]. So okay, I'll try 'em! I'm your girl! Thank you for all of the recipes — now I am going to go through a bunch of them and have a taste-test every day. They look so good. This one is sun tea, made from Twinings black-currant black tea, eight bags in two quarts water, sitting in the sun for about four hours, sweetened with agave, with a little bit of the black-currant nectar poured in. It tasted quite different from the tea yesterday — more bitter? Did I let it go too long or not long enough? Or maybe that's just how it is, and the taste-diff between black and white tea? Next I'm going to try one of the peach ones that were suggested. But probably not today because I am going to a CORGI PICNIC. I can't wait. Clover Meadow has a new collar and everything. Right now she is flopped over, with her head on my foot, having just come home from the park. She is totally oblivious to what the day holds.